I was born in Amersham in Buckinghamshire at an early age. Initially, I was unable to fend for myself. I could not work out how to walk or even say words. Luckily, a kind lady and gentleman took me home from the hospital. My mother taught me to speak nicely and talk about the weather. My dad mainly used to cook a pie. It wouldn’t always go right. Quite often he would drop the pie on the floor. “I’ve dropped the pie on the floor!” he would shout. That’s what he’s like, because he doesn’t use oven gloves. Amazingly, it went well, due to comic timing, stage presence and luck and I resolved on the spot to become a professional entertainer. 17 years later, I became an overnight success. A show that’s as precise as it is seemingly random…Dreams are rarely this weird or wonderful. Something of a comic genius. He is completely in charge. An hour in his company is one of wet faced glee and it’s over in a flash. His jokes fit together in complex ways like equations beyond the reach of our understanding. A work of genius, and one of the best comedy shows ever to have been performed in Melbourne. Highly intellectual and ridiculously silly. There is a constant sense of danger, yet you are in safe hands. I cried with joy. His first time at the Melbourne Festival, Paul Foot is simply the best comedian I have ever seen – and the most difficult to describe. Reviewing convention dictates I can only give him five stars, but his insane genius deserves at least six. It takes quite a jockey to ride with Foot for the full hour but if you can gallop the distance then you’ll trot out at the end feeling as sturdy and invincible as a shire horse. Had us scratching our heads at his genius. Comedy gold. Wholly original and frequently very funny, a wonderful ear for language and a talent for creating glorious spirals of absurdity out of the simplest of starting points. My eternal favourite, he’s a comedy genius. One of the funniest things I’ve seen. Unique solo shows and one of the best Never Mind The Buzzcocks EVER. Quite simply, he is mind blowing, so if you fancy your mind being blown Paul Foot is one of the few comedians working today who can do it for you. There’s perverse brilliance in Foot’s upending of the comedy rulebook. Inimitable, rare and unfathomably funny. It’s inspired, surreal and incomprehensibly funny. Don’t question it, just go with it. Not exactly Danny Bhoy, is it? …. a wildly divisive yet oddly invigorating hour out during a Fringe full of bog-standard observational stand-ups. Will have you chuckling to yourself for days after. If, thanks to a diet of mainly bland, made-for-TV standups, we’ve forgotten what raw, risky character comedy is all about, an evening with Paul Foot will remind you…This is Foot at his best, speaking universal truths and – like Woody Allen – making them seem less daunting to the repressed masses. Like a cult classic, a relic from the past, a rare exotic bird, he’s special. Paul Foot’s latest staged meltdown is revolutionary character comedy at its most brutally hilarious…. The term ‘mad genius’ has been chucked around willy nilly down the ages. It has surely found its rightful place stuck upon this man. It’s impossible to describe what Paul does, it’s like trying to strangle mercury. In an all too often predictable comedy universe, Paul Foot orbits his own planet. Fantastic. He commands a significant cult following, and when you see him in action it’s not hard to understand why – his seemingly off-the-cuff flights of fancy will compel you to seek out the company of this peculiar man time and time again. 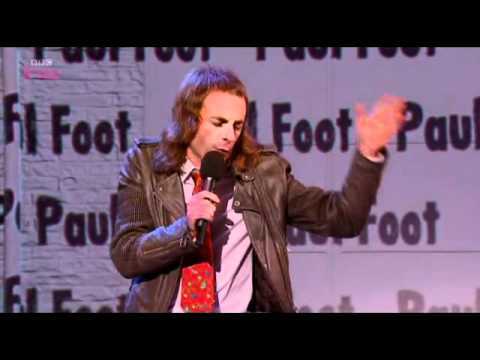 Paul Foot doesn’t tell jokes, as much as have an occasional idea… and then with fumbling and pin-point accurate observational humour makes us all laugh about it for fifteen minutes. Rarely, if ever, has this reviewer seen an audience laugh as hysterically or long. A hilarious combination of pedantry, bluff and surreal non-sequiturs. He attacks the funny bone from an utterly obtuse angle. There is no logical reason why Paul Foot’s comedy should work, but work it does – to hilarious effect. Never before has so much been laughed at so little. The missing link between Ross Noble and Frankie Howerd. Choice silliness which no other comic could deliver anywhere near as effectively. Paul Foot’s timing is spot on, his material imaginative, and he has the audience with him all the way from start to finish. Multiple daftness…delivered with inspiring pedantry and passion. I lived the dream at The Phil. Quality Night, Bunch of LEGENDS - Cheers!